Come visit us and see why people keep coming back!! We have a wonderful view of the ocean and sand dunes from our livingroom/patio. Our unit has wifi so bring your laptops and connect to the internet free of charge. This 2 Bedroom Condo is the larger of the 2 bedroom units at BSV. This is ground floor level so no steps to deal with. 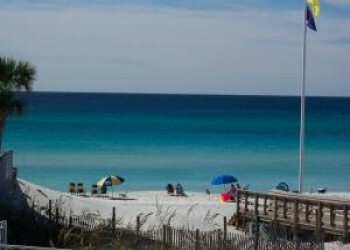 You are only steps away from our unit to one of the most beautiful, award winning, white sand Beaches in the US! Enjoy the 17 mile bike trail on scenic 30-A and only a short walk on the beach in front of our complex to picturesque Deerlake State Park. The park has 1,700 acres of the most beautiful natural scenery and also is a wildlife sanctuary with walking trails. Its worth the visit to this secluded beach area. The view from our deck and living room is of the ocean and sand dunes. Our first floor unit has a master suite and full bath. The second bedroom has two full beds, full bath plus there is a pull out sleeper sofa in the living room. Two TV’s in unit plus DVD player. Fully-equipped kitchen. Modern, clean, and well kept. Unit is Non-Smoking and No Pets please.